Acoustic enclosure for a `Horizontal Balancing Machine’ installed within a new `Engine Assembly & Test Facility’ at a major UK based aero engine manufacturer. To design, manufacture, deliver, install and commission the required acoustic enclosure, this being of approximate overall dimensions 9.2m long x 5.8m wide x 4.5m high. The unit to be modular in construction for transportation purposes, to facilitate assembly around the existing balancing machinery and associated ancillary /auxiliary equipment, whilst also reducing site installation time (and hence machine downtime). 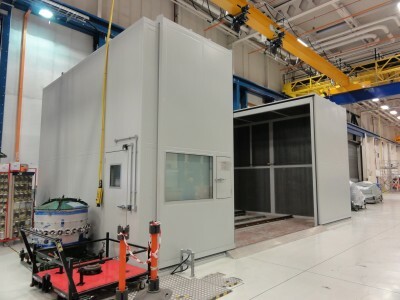 When fully assembled, the enclosure to provide the desired access in the form of bi-parting pneumatically operated, horizontally sliding doors and canopy (giving unhindered access to both the enclosure front and roof over an area approximately 5.0m long) to facilitate the loading and unloading of components, tooling & equipment via an overhead shop crane, and a personnel access door – all fully integrated with the end users ‘factory standard’ door interlock system. Surface mounted floor track arrangement with external rampart and internal aluminium tread-plate decking, offering personnel safe passage in and out of the enclosure without encountering an unacceptable trip hazard. A flush fitting track (recessed into floor) option is also available. Acoustically insulated vision panel having the required resistance to internal damage by projectiles, flying debris etc., and a listening hatch to provide the machine operators with an audible means of monitoring the balancing process. The provision of robust high frequency lighting suitable for rotating machinery. High duty ventilation of the enclosed equipment to ensure that the temperature rise inside the enclosure was acceptable and allowed it to operate in a normal manner. From an operational noise level of 95dB(A) at 1m from the machine, the enclosure reduced noise levels down to 70dB(A), well below the First Exposure Action Level of the CNAWR 2005.